On this global day Luxe Bloom cannot help but stop to search for women who lead and change a little slice of the world, around the world. "I am not a lone voice, I am many." Malala Yousafzai was born in 1997 in Mingora, Pakistan. She is an advocate for women’s rights to education, and is the youngest person to be awarded the Nobel Peace Prize. She began her activism as a child, speaking out publicly against the Taliban’s attacks on girls’ schools. She also started a blog under a pseudonym about her experiences and activism, but her true identity was eventually revealed. 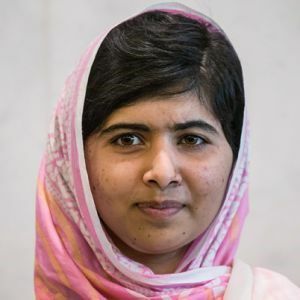 Despite being a child, her activism made her the target of death threats from the Taliban, and a man attempted to assassinate Malala by shooting her in the head. She survived her injuries, and moved to the United Kingdom to complete her education and continue her activism. She has since started the Malala Fund, which has as its mission to enable girls all over the world to have safe, quality education. 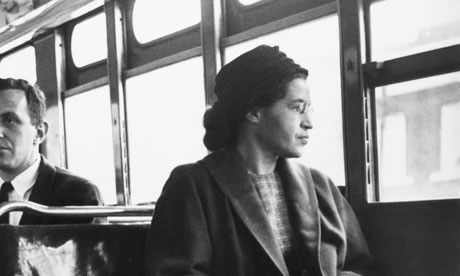 Her act of disobedience was what Dr. Martin Luther King called the catalyst of the 381-day Montgomery Bus Boycott. During the time of the boycott, she suffered much hardship for her activism. She and her husband were forced to move away from Montgomery to escape death threats and economic sanctions. Parks received the Presidential Medal of Freedom, the Congressional Gold Medal, was honored with a postage stamp, and upon her death in 2005 was the first woman to lie in state in the rotunda of the US Capitol. Angelina Jolie Pitt is one of the world’s top movie stars, renowned for her beauty and her exciting personal life. She has also devoted her life to humanitarian causes, which began after she witnessed the conditions in Cambodia while filming Lara Croft: Tomb Raider. Her experiences in Cambodia led her to begin working with the United Nations High Commissioner for Refugees (UNHCR). She went on over 40 field missions with the UNHCR, funding her own expenses and living in the same conditions as other workers. She also traveled to war zones to meet with refugees and advocate on their behalf. Jolie Pitt is also involved in conservation efforts and efforts to promote education. She is a Special Envoy to High Commissioner Antonio Guterres of the UNHCR, and is empowered to represent the organization on a diplomatic level. She also has received The Freedom Award, the Citizen of the World Award, the Jean Hersholt Humanitarian Award, and others. In 2014, Jolie Pitt was named an Honorary Dame Commander of the Order of St. Michael and St. George by Queen Elizabeth II for her humanitarian services to the UK’s foreign policy, one of the few Americans to receive this honor. First known as a child actress from her work in the Harry Potter franchise, Emma Watson is now becoming known for her activism on behalf of gender equality. Watson began the “HeForShe” campaign, which aims to hold men as accountable as women to work for the cause of gender equality. Watson gave a speech before the UN in support of her campaign, and has gained support from all over the world. She has been named one of the “100 Most Influential People” by Time magazine, is a UN Goodwill Ambassador and an Ambassador for Camfed International, which advocates for women’s education in rural Africa. Watson has recently pledged to take a year away from acting to focus on her humanitarian works. At 21, Tegla Loroupe became the first African woman to win a major marathon. Her win gave her a unique status and voice – at last there was a female champion to serve as a role model and inspiration along with all the male athletes. 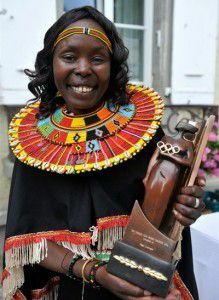 Loroupe held the women’s marathon world record and won many prestigious marathons. Since retiring from running, she has devoted herself to various initiatives promoting peace, education and women’s rights. In her native Kenya, her Peace Race and Peace Foundation have been widely praised for helping to end tribal conflict. In 2015, she became an Ambassador for the Homeless World Cup, a group that advocates for the end of homelessness through the sport of football (soccer). Loroupe has been recognized as being an instrumental force in promoting peace and conflict resolution through sports. 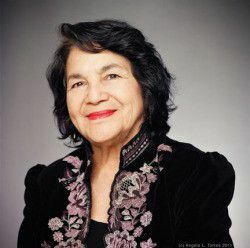 Dolores Huerta is the co-founder, along with Cesar Chavez, of the National Farmworkers Association, which later became the United Farm Workers. One of her major inspirations is her mother, who ran a 70-room hotel which housed low income workers, often letting them stay for free. Her mother was also deeply involved in activism, which set the groundwork for Huerta’s life mission. In 1962, she and Cesar Chavez formed the National Farm Workers Association, which eventually became the United Farm Workers (UFW). Its mission was to protect the rights of farm workers, who were often underpaid and exploited. They joined forces with the Agricultural Workers Organizing Committee (AWOC) and participated in the “Delano Grape Strike” of 1965. The two organizations eventually formed the United Farm Workers Organizing Committee, which in 1972 became known by its current name, the United Farm Workers (UFW). She was named a Woman of the Year in 1997 by Ms. Magazine, and received a Presidential Medal of Freedom in 2012 from President Obama.